When it comes to Hotels In Murrells Inlet, we've got you covered. Experience the most luxurious and comfortable of all the hotels in Murrells Inlet SC with one of our 34 full-efficiency rooms. 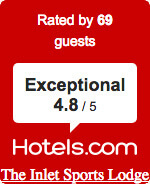 We have twenty-nine Standard Deluxe Studio Rooms and five Luxury Suites. When you stay with us you can enjoy complimentary WiFi, daily housekeeping, parking, and a light continental breakfast all included with your stay. Be sure to ask about our custom Myrtle Beach golf packages, which include True Blue & Caledonia! Our Standard Room is the full efficiency Deluxe Studio. It features your choice of a King Bed or 2 extra-long pillow top twin beds, as well as a kitchenette with standard refrigerator, microwave, coffee pot, two top burner stove, dishwasher and basic cookware and dining utensils. A queen sleeper sofa can be paired with the King or Twin Beds in the Deluxe Studio. Bathrooms are equipped with a shower featuring 4 massaging body jets and a rain-head showerhead. 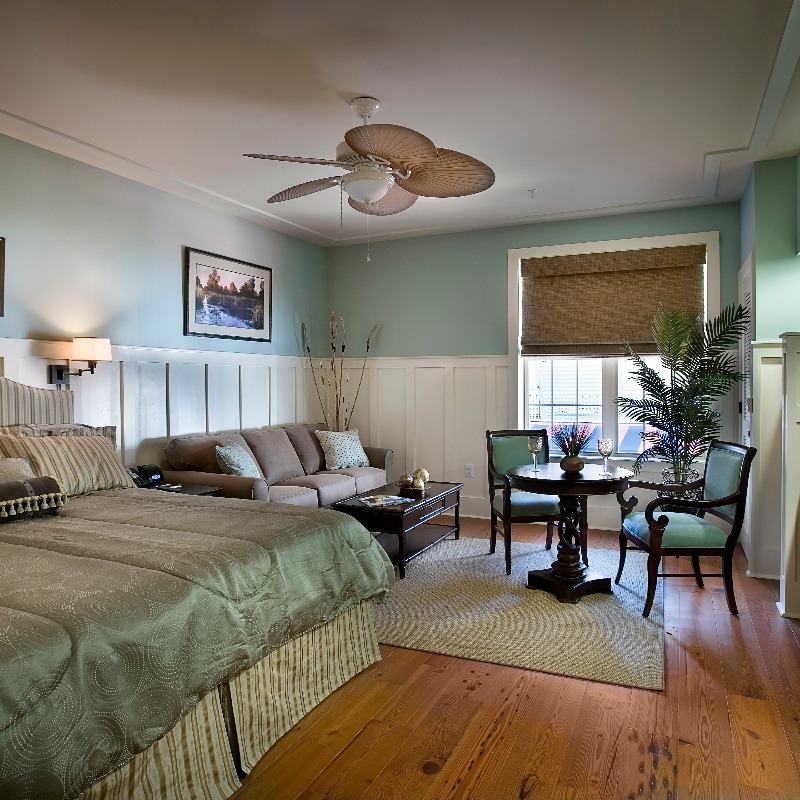 Each room is also accommodated with flat-screen TVs and Room details such as hand-carved mahogany doors, pine floors and antique-style crown molding. The Deluxe Studio comfortably sleeps 2 adults and 2 children. A 3rd adult may be included at a small, daily extra-person fee. View a 360 degree view of the room here. 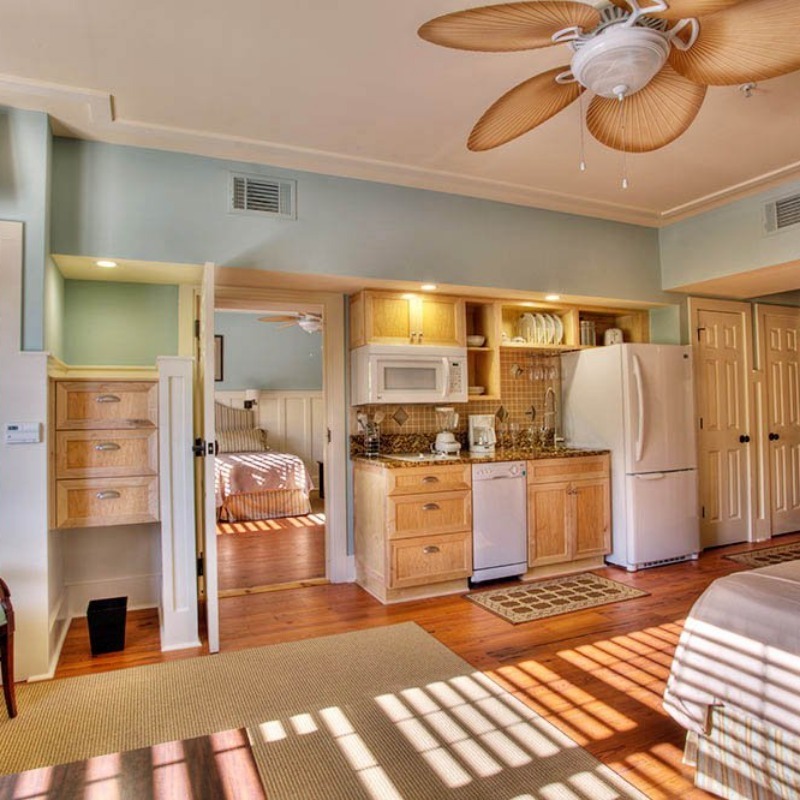 For those families or parties of 3 or more adults, we recommend our 2 bedroom Luxury Suite. Our Luxury Suite consists of the standard Deluxe Studio room (mentioned in detail above) plus an adjoining room that mirrors it. The adjoining room of the Suite has a microwave, mini fridge, coffee pot and ice bucket instead of the full kitchenette, and has a regular loveseat sofa instead of the queen sleeper sofa. Room details include flat screen TVs, and features such as hand-carved mahogany doors, pine floors and antique-style crown molding.